Doctor Faerie Godmother: IWSG How did I end up with the cliche insecurity? 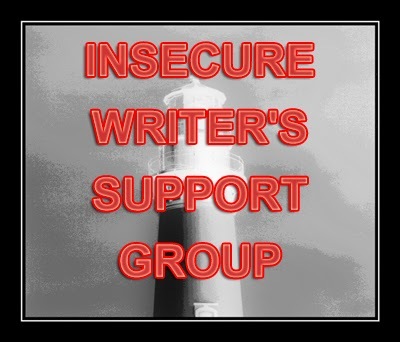 Insecure Writer's Support Group is a blog hop brought into the world by the Amazing Ninja Captain, AKA Alex Cavanaugh. If you haven't heard of IWSG, then check out Alex's blog before hopping on Mr. Linky and taking a spin through the insecurities of writers. This month Alex has some Ninja lieutenants helping him out, Sheena-kay Graham, Julie Musil, Jamie Ayres, and Mike Swift, so be sure to give them a wave and a smile. So what's been eating me? You know, the usual. I'm always worried that I won't "make it." Yeah, you heard me, I even put it in tacky quotes. I feel like it's the stupidest insecurity to have. It's not very original for starters (I mean really, what if my secret insecurity was that I was really afraid of an alien invasion like that one in my dreams where the aliens would take over people, but you couldn't tell until they spoke and a single bell tone came out of their mouth before they exploded, sometimes killing people in the blast radius--now that would be an awesome insecurity). But everyone wallows in the "What if I never make it?" doldrums. It's right up there with runners complaining about big thighs and blisters on their feet. And worse, it's completely illogical. I've already set the phasers to kill, I'm not stopping short of "getting there" (wherever that is). It's not like I'm afraid of failure. I've already been to the top of Ruined Dreams Hill (the view isn't as spectacular as you'd hope, but it's good for getting your bearings). For All that Is Chocolate, I built a log cabin up there and spent the better part of a year being an idiot, so by all rights, it's sort of comfortable up there in Delusions of Adequacy land. So if I'm so comfortable with my ability to fail, and I've already laid out the plan and promised myself that this is the dream where I get to be stubborn like a llama*, then why am I worried about never reaching my writing goals? No amount of No is going to stop me. So why? It's an odd trait of the human condition, but no matter how determined and how much grit, even the strongest, bravest, and most stubborn of us all would like to know that our work will pay off. And let's face it, writers have a ton of writing they have to do before any pay off. It's hard to have faith as a writer when all the doors say no, so here it is, here's how we are going to make our writer goals come true. You ready? If you are just starting out: give yourself a pat on the back. Every journey begins with a single step, but if you never start, you will never finish. I know well over a hundred people who have told me that they are going to write a novel but never have. So good job, you've started. Now, get back to writing. If you've finished your first novel: Congratulations! That's hard (and I'm not being patronizing, that is hard, like pull your hair out hard). Give yourself a well deserved toast. Now, get back to writing. If you've signed with an agent/your dream publisher/released your book through Flavor of the Month Indie Publisher: Super Congratulations! Those are major milestones! There are heaps and heaps of people who didn't make it this far. Fear held them back, or maybe some other insecurity (those aliens, I tell you!) kept them from The End, but not you. And you've hit some big time publishing goals. Awesome! Now, get back to writing. Because making it is really about sticking it out. If you refuse to stop writing, strive to learn your craft, and keep moving forward, your writing goals will come true. That's the formula: Write, Craft, Learn, Revise, Repeat as necessary. It's simple, but hard (hint: most good advice is simple but hard). *About llamas and stubborn. People always associate donkeys or mules with stubbornness, but let me be the first to tell you that llamas are smart, and they don't mind telling you when you're wrong. They do not change this opinion, and when you are spectacularly wrong, they go on strike by folding up their legs and sitting on the ground. When you argue, they spit in your face, and that spit, well, it's more like spit up if you catch my drift. If you don't catch my drift I might have to make another post from those years on the farm. Hehe, love how getting back to writing is the refrain of this post. That's the key, after all. Unless you're Harper Lee, of course. Funny, the question of whether or not I'll 'make it' didn't bother me so much when I was writing the first novel. Only when I let a few people look at what I'd written was when it began to sink in--I want people to see this stuff! It's kind of addictive I think. The scary thing has to be that 'making it' is in many ways out of our control. What people like to read can change, and whether they will find our work is subject to the whimsy of the Internet. I don't know that i ever feared not getting there. I think i always thought i would. Maybe it would take ten years, or maybe it would take one, but i was pretty sure that sooner or later it would happen. Get back to writing! Yep, simple, to the point and the only thing we need to remember. Thanks for the reminder. I'm giving myself an hour to read IWSG posts and then I'm getting back to writing. By the way, those aliens of yours might be worse than the ones that filled my high school with a river of lava. I still haven't figured out how my row boat didn't disintegrate... man I love crazy dreams! Write, Craft, Learn, Revise, Repeat...love it. I would also add, keep moving on and accept the dream can come on many forms. If you are writing from that place of love (obsession) then don't pigeon hole yourself into thinking their is only one path to success. I see a lot of talented people drop out because they only saw one path possible. Knowing how many times you've reminded me that every writer feels this way, it's oddly reassuring to see that you're not excluded from needing the advice you give. ^_^ And it's good to know that you can listen to it as well - I've known too many people who couldn't take their own advice, strange as it sounds. Ah, Dork tower is awesome! I have no idea how we can stop ourselves feeling like this. I guess it's a good personality trait, really, to not be over-confident about our own talent. A sort of modesty. The trouble is, it troubles us! A non-writer friend today said to me 'If you don't mind me saying, you seem to beat yourself up a lot, and then you beat yourself up for beating yourself up.' I couldn't deny it! Have faith! Channel that determination! Thanks for your comment on my blog - I totally agree that the more time I have, the less writing gets done! but heeeyyy, back to the point of this post. I don't really worry about whether I'll "make it" or not - more I worry about whether I will actually ever self-publish anything, because that is my main goal right now. Get something published!! i feel like i've made it small time, and the harder i work, the bigger my making it becomes... work, work, work! but i do enjoy it! your make it moment will come, my friend! You know, it's funny, but there are way more comments on the llamas than the aliens exploding. I guess I'll have to talk more about the llamas. And Yeah, I know what you mean, making it has so many levels. This sounds really amazing. Thanks for this post! Grit and determination is good to have. Actually, I'd say you have to have it to take the next few steps, write, learn, revise and write more. Just like anything else you want to be a success in you have to learn and apply and seep moving forward. Hehe -- "Now get back to writing" --- love that advice because it's the best part of this whole thang.